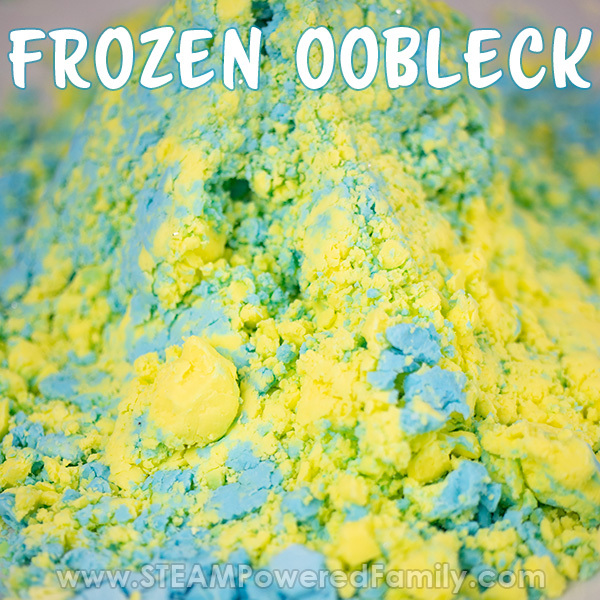 When it comes to Oobleck, our favourite non-Newtonian Fluid, we have created so many different versions, from glow in the dark to magic colour changing oobleck. 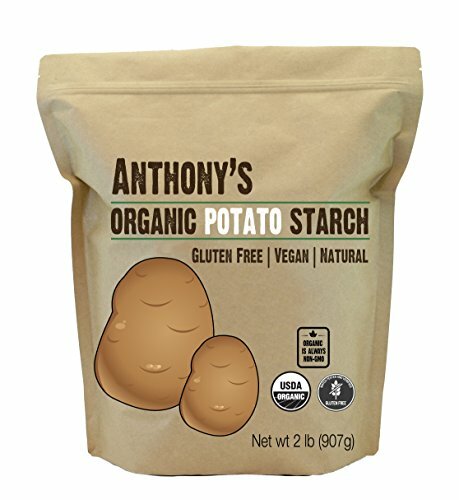 We explored a variety of recipes from the standard using cornstarch to our favourite recipe that uses the humble potato. Oobleck is an amazing science project. 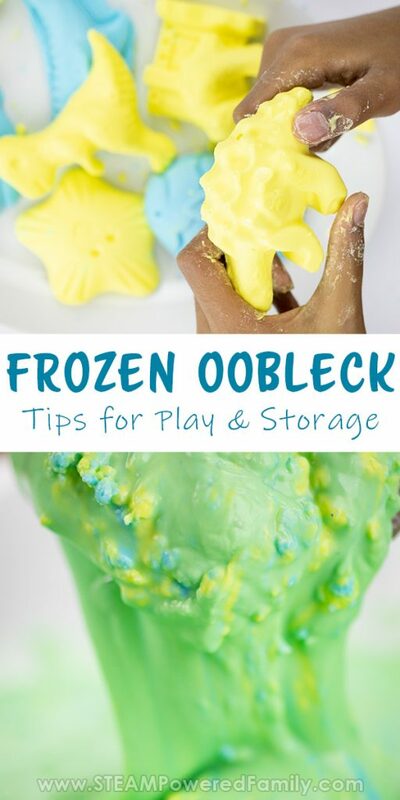 The one thing we hadn’t cracked yet was how to store Oobleck. 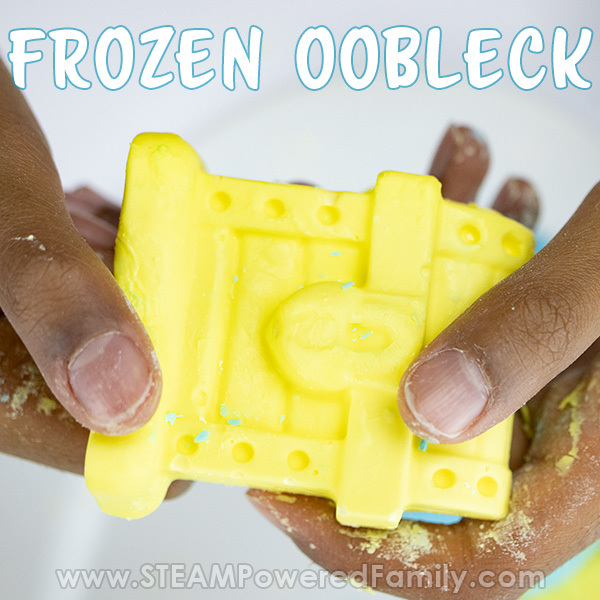 Then we discovered a fun new way to play with oobleck, while also storing it! 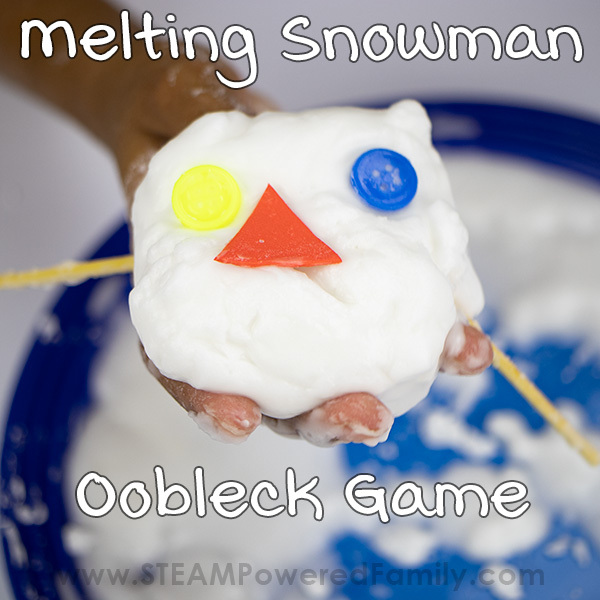 So the big question of the day if you are new to Oobleck, is what is this stuff? Oobleck is a non-Newtonian Fluid. This means it doesn’t follow Newton’s Laws of Fluid Dynamics, and behave the way we would expect a fluid or liquid to behave. Think about water. If you pour it out of a container, you know exactly how it is going to behave as it flows onto the ground, splashing as it lands. If you freeze it, it will become solid. If you add something like dirt to create mud, which has greater viscosity, you know how this will affect it’s ability to flow. Greater viscosity, means less flow. It all follows logical and predictable behaviour patterns. But not our Oobleck. See Oobleck is our rule breaker. If you squish a handful of water or mud in your fist, what is going to happen? It’s going to ooze out. But not Oobleck, it becomes solid under pressure. Behaving almost like a play dough or clay. But release that pressure and it flows like liquid again. Pretty cool! The scientific term for what is happening when it solidifies is Shear Thickening. 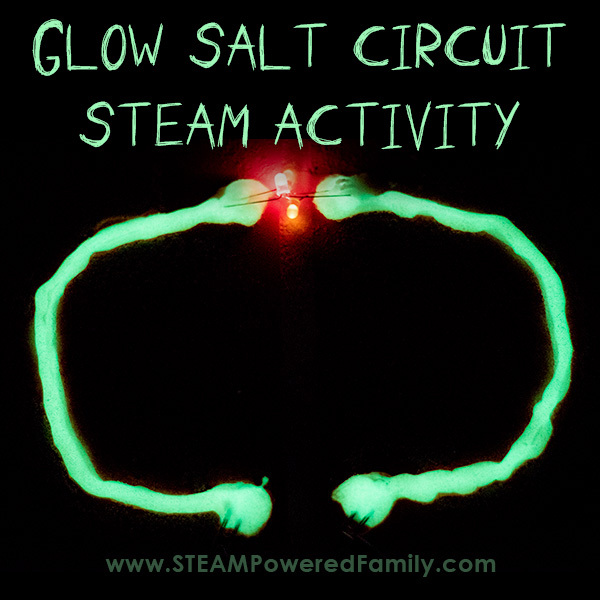 To learn more about this process, you can watch this fascinating explanation from Cornell University. So the next question is how do we make this amazing substance? 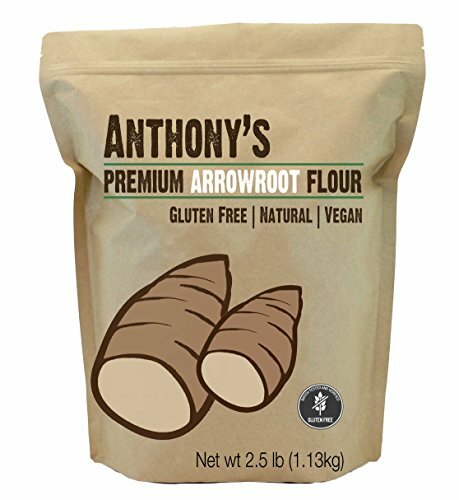 It’s actually crazy easy and uses items you probably have in your pantry right now. 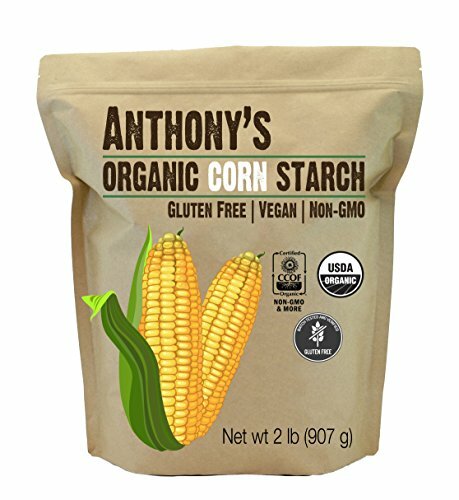 The most popular recipe is to use cornstarch with water. 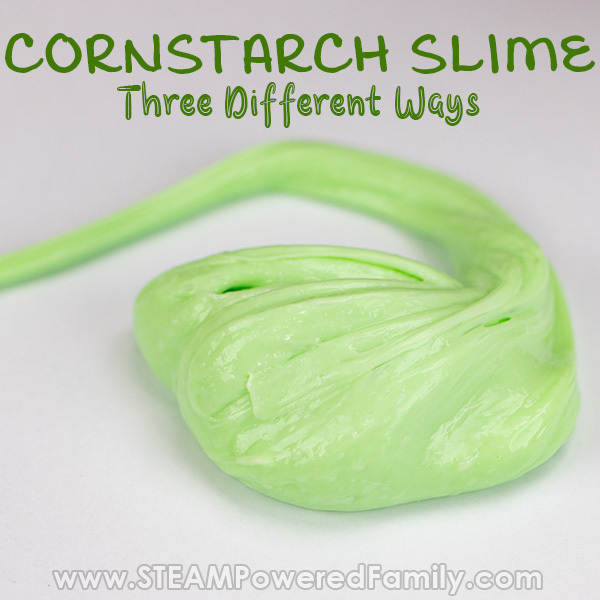 You will need to use 2 parts cornstarch to 1 part water. Simply mix and play! It’s really that easy. You can add in a bit of food colouring to your water to make your Oobleck interesting colours, or toss in a few items to make playing with it more interesting. But there are lots of other recipes that work just as well, if not better. We have made Oobleck with Tapicoa, Arrowroot, Baby Powder and our favourite, Potatoes. 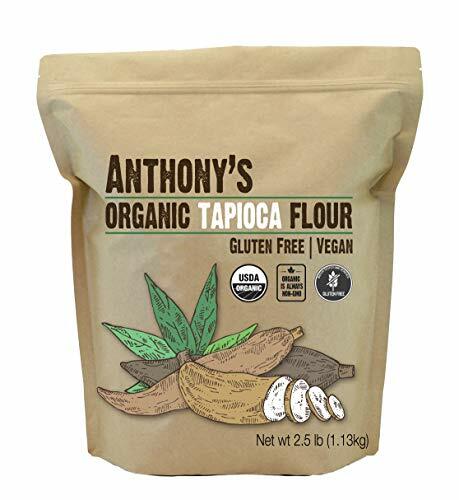 The ratios do vary slightly to get the best Oobleck from each ingredient, so if you are using anything other than Cornstarch, make sure to check out the articles for the ratio changes, or experiment and find what works best for you. 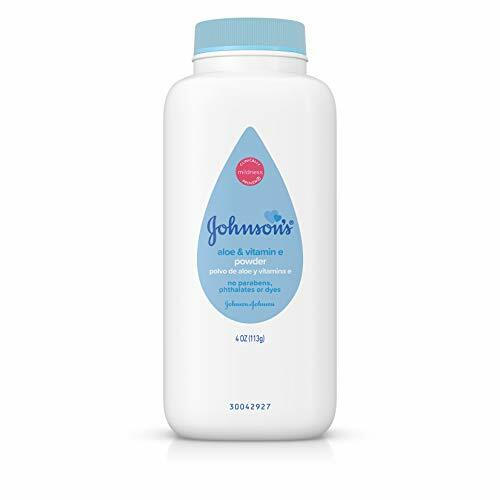 STORINg oobleck – Is it possible? In the past when someone asked me about storing Oobleck I would say it wasn’t possible or worth it. 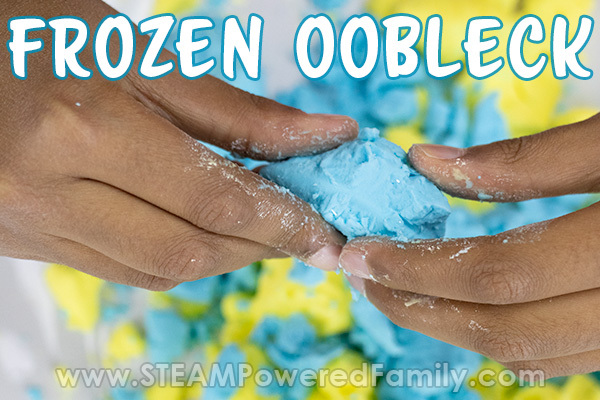 Oobleck is so quick to make and only costs pennies a batch, why would you store it? I also have this thing about bacteria growth. We’ve done petri-dish studies and know how bacteria loves to grow in moist environments. So the idea of keeping a batch of Oobleck was just really unappealing to me. But then I spoke to some teachers and realized that there are times when it would just be a lot easier for them to make a batch of Oobleck ahead of time, or have a parent make it at home, and then have it ready for the classroom. I’m all about helping to make teachers lives easier, so I played with a few ideas as we made our batches of Oobleck. None of them performed the way I wanted. Letting it dry out back to powder cornstarch was the best, but then you might as well just make a fresh batch. Plus I know many teachers have concerns around bacteria and mold growth in food substances. It’s a very valid safety concern with any item like Oobleck, slime or play dough where kids are playing with it. Then my son had an idea. See it’s REALLY cold here in the Canadian North. Everything is frozen. So he asked, what would happen if we froze Oobleck? Challenge accepted! I love it when kids questions inspire our science investigations. And it led to an answer to the storage problem for teachers, win-win! 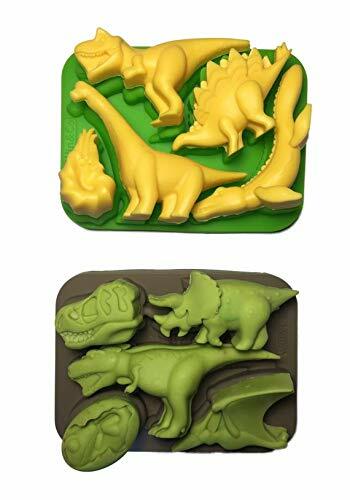 First up we took my son’s idea and filled some silicone molds with Oobleck and stuck them in the freezer. 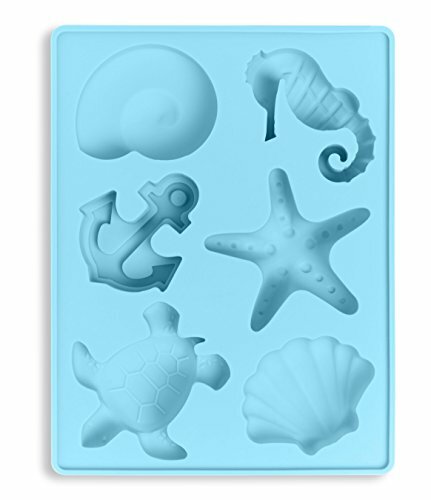 We found using large molds the best. We went with Oobleck dinosaurs and under the sea pieces. The next day we popped them out. It was really cool and man they were HARD. It was impossible for us to break them. 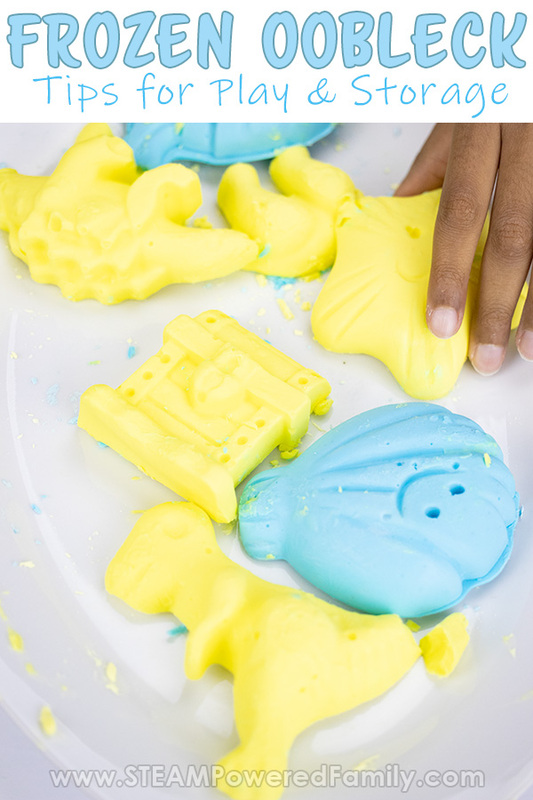 We played with them on and off throughout the day as we waited for the Oobleck to thaw. Eventually we were able to break the pieces, but we noticed something strange happening. As the Oobleck thawed it wasn’t turning into a liquid. It was becoming quite a dry, moldable substance. Kind of like a crumbly clay or softer kinetic sand. With a bit more time it really crumbled and broke down. But still no non-Newtonian Fluid behaviours. Instead it was the texture of crumbly clay. We had a very interesting result! Now we knew from all of our previous Oobleck experiments that Oobleck starts to dry out and thicken into more of a play dough or clay as it sits out. Eventually it will dry out completely back to just cornstarch. So our first step was to add a bit of water and see what happens. It worked perfectly and we ended up with a great non-Newtonian Fluid once again. But an idea was seeded. I knew how freezing things really dries them out. Ask any Canadian, there is not enough moisturizer in the world to keep our skin from drying out like a husk in the depths of our winters. We needed a way to protect the Oobleck from drying out during the freezing process. The answer was incredibly simple. The answer was the humble little freezer bag. After playing with our Oobleck for a bit we took the whole batch and transferred it into a freezer bag. We then froze it. The next day we pulled out the freezer bag and let it thaw with the bag still sealed. To speed up the thawing you can set it in warm water. Once thawed completely we had a perfect Oobleck again! I was so excited I had to show it off on Instagram. 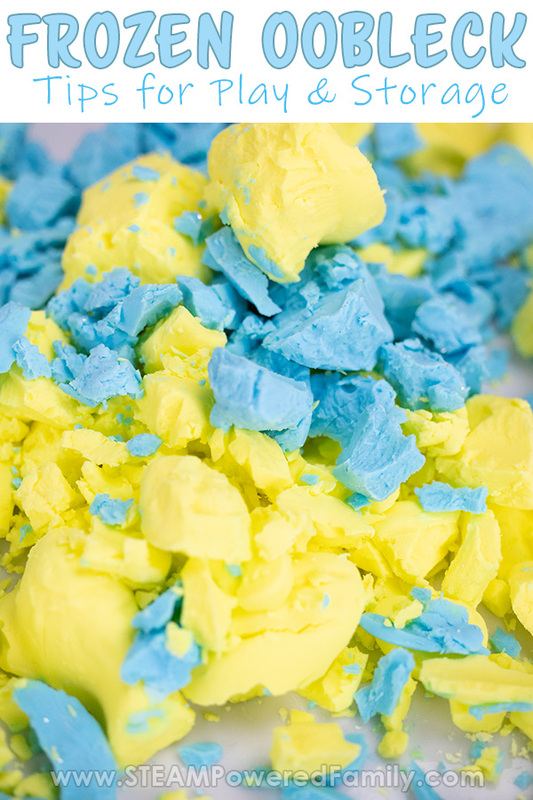 If you are making Oobleck for a classroom this way, I recommend putting the cornstarch into the bag, add the water (colour the water first for ease of mixing), then seal it and squish it in the bag to mix it up. 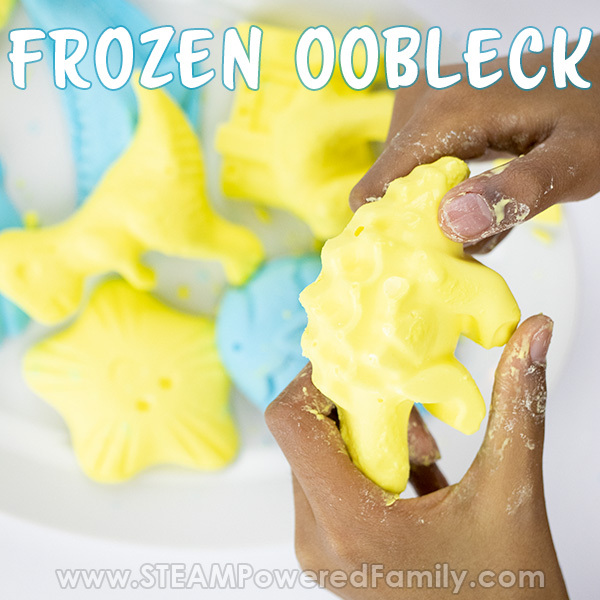 It’s super easy to make Oobleck this way. Then toss the bag in the freezer until you are ready to use it. The thing I like is that the freezing process stops bacteria and mold growth, so I feel much safer storing Oobleck this way for future use especially if we have played with it first. For safety reasons I am not a big fan of storing things like slime. But this is one instance where I feel safe storing Oobleck, even if it has been played with a bit. So there you go! A chilly, winter fun Oobleck play session and a solution for Oobleck storage all from one child’s “I wonder what would happen…” question. This is the power of investigation and imagination. Encourage your kids to ask those questions, then help them investigate!